SCVHistory.com LW3420 | Film-Arts | William S. Hart is 'The Captive God' (1916): Publicity Still. 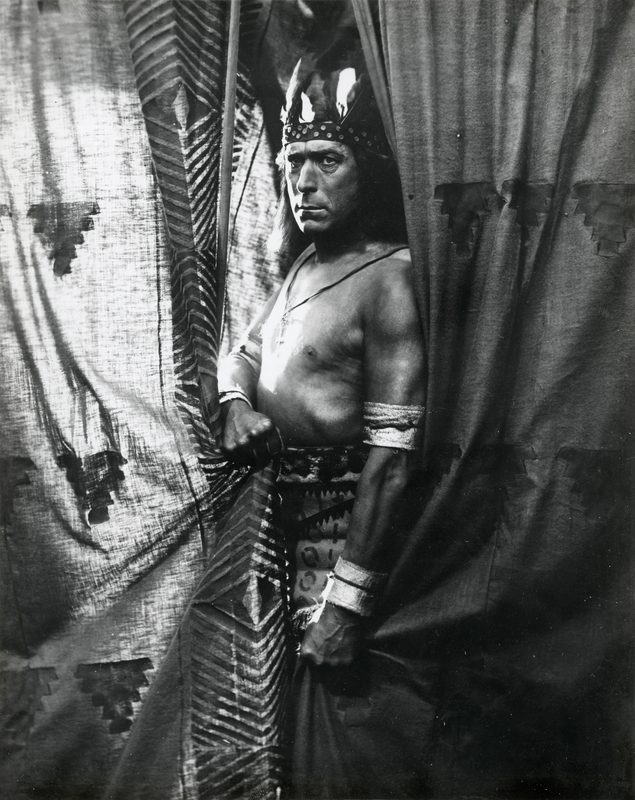 William S. Hart is "The Captive God"
In "The Captive God" (Triangle Film Corp. 1916), William S. Hart plays Chiapa, a white boy raised among Mexican Indians in the 1500s and thought to be a god because of the color of his skin. White boy meets Indian priestess (Enid Markey), but then the rival Aztecs attack and carry her off. In trying to rescue her, Chiapa is captured — thus the title of the picture. As for the rest of the story, you'll just have to see it ... which could be difficult. But not impossible. Apparently a print resides in the collection of the George Eastman House in Rochester, New York. Original publicity still, 8x10 inches, from the (Vincent) Mercaldo Archive of New York (see below). According to Koszarski (1980:48), this photo shows Chiapa as he is about to be sacrificed to Tezcatlipoca — the actual Nahuatl god of the night sky (not a made-up name). The other names make some sense, too. Hart's character, Chiapa, is suggestive of Chiapas, the region at the southern tip of Mexico just beyond the border of the Aztec Empire as it existed in the 1500s. The tribe that adopts Hart's character is called the Tehuans, which might refer to Tehuantepec, a village at the former Aztec borderlands with Chiapas, in modern-day Oaxaca. How he came by the Christian cross he's wearing around his neck is unclear. Produced by the Triangle Film Corporation under the supervision of Thomas H. Ince; distributed by Triangle; released July 23, 1916; production cost, $50,000 (per press release); five reels. Directed by Charles Swickard; story and screenplay by Monte M. Katterjohn; photographed by Clyde DeVinna; art director, M. Doner. CAST: William S. Hart (Chiapa); Enid Markey (Lolomi); Dorothy Dalton (Tecolote); Robert McKim (Montezuma); P.D. Tabler (Mexitli); Dorcas Matthews (Maya); Herbert Farjeon (Cacama); Robert Kortman (Tuyos). SYNOPSIS: The picture tells the story of a little Spanish boy who is cast upon the shore of the east coast of Mexico early in the sixteenth century, when Mexico was dominated by the Aztec Indians. Never having seen a white person before, the local natives, a tribe called Tehuans, bring him up as a god and call him Chiapa. When he reaches manhood, Chiapa is given authority over his entire tribe. He falls in love with the priestess, Tecolote, and she yields to his advances though she is quite unworthy of him, and encourages other suitors. Then the Aztecs hear that under the white god the Tehuans are very prosperous, and start forth to conquer them. The Aztec army is under command of Mexitli, the chief general of Montezuma, the Emperor; and having conquered the Tehuans, carries off Tecolote as his personal slave. Chiapa follows as a spy. In the garden of Montezuma, his is wounded by a guard; but Lolomi, the beautiful daughter of the Emperor, saves him. They fall in love. Meanwhile, Mexitli has tired of Tecolote, and now seeks the hand of the Princess Lolomi, who would rather die than have him. As the Emperor gives Mexitli his consent, he tries to get the princess by force, and in doing so discovers Chiapa. Vicent Mercaldo, an Italian immigrant, was an early-20th-century Western historian and painter who collected a large number of documents, photographs and other memorabilia, especially concerning William "Buffalo Bill" Cody. His paintings and documents are featured in several Cody biographies, and his collected photographs reside in the Buffalo Bill Center of the West and other museums. His original publicity photos of William S. Hart were acquired for SCVHistory.com in 2018. The New Yorker | August 20, 1955. Did you know that the largest collection of Buffalo Billiana in private hands is in the private hands of Vincent Mercaldo, Brooks Brothers' head necktie cutter and patternmaker? We journeyed up to Mr. Mercaldo's apartment in Queens the other evening and found ourself in a living room containing a painting of William F. Cody on horseback, and another of Custer's last fight. Custer's hands were gloved, and each was holding a Colt revolver. "I made a mistake there," said our host, who had painted both pictures. "A man can't shoot a revolver with gloves on. At least, Custer never did." 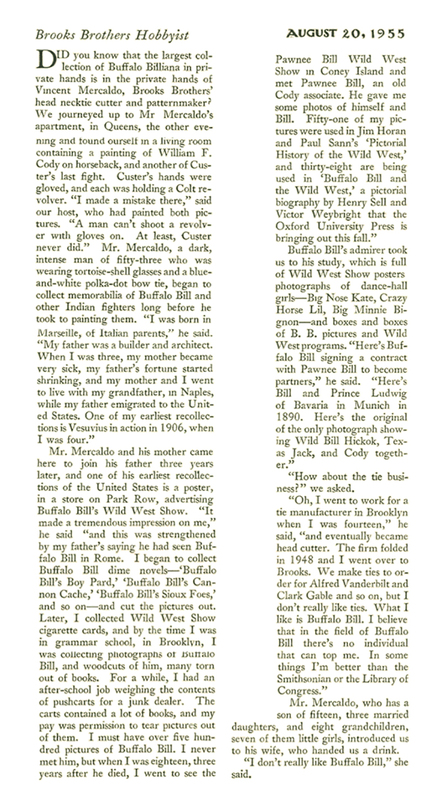 Mr. Mercaldo, a dark, intense man of 53 who was wearing tortoise-shell glasses and a blue and white polka-dot bow tie, began to collect memorabilia of Buffalo Bill and other Indian fighters long before he took to painting them. "I was born in Marseille, of Italian parents," he said. "My father was a builder and architect. When I was 3, my mother became very sick, my father's fortune started shrinking, and my mother and I went to live with my grandfather in Naples while my father emigrated to the United States. One of my earliest recollections is Vesuvius in action in 1906, when I was 4." Mr. Mercaldo and his mother came here to join his father three years later, and one of his earliest recollections of the United States is a poster in a store on Park Row advertising Buffalo Bill's Wild West Show. "It made a tremendous impression on me," he said, "and this was strengthened by my father's saying he had seen Buffalo Bill in Rome. I began to collect Buffalo Bill dime novels — 'Buffalo Bill's Boy Pard,' 'Buffalo Bill's Cannon Cache,' 'Buffalo Bill's Sioux Foes,' and so on — and cut the pictures out. Later, I collected Wild West Show cigarette cards, and by the time I was in grammar school in Brooklyn, I was collecting photographs of Buffalo Bill and woodcuts of him, many torn out of books. For a while, I had an after-school job weighing the contents of pushcarts for a junk dealer. The carts contained a lot of books, and my pay was permission to tear pictures out of them. I must have over 500 pictures of Buffalo Bill. 1 never met him, but when I was 18, three years after he died, I went to see the Pawnee Bill Wild West Show in Coney Island and met Pawnee Bill, an old Cody associate. He gave me some photos of himself and Bill. Fifty-one of my pictures were used in Jim Horan and Paul Sann's 'Pictorial History of the Wild West,' and 38 are being used in 'Buffalo Bill and the Wild West,' a pictorial biography by Henry Sell and Victor Weybright that the Oxford University Press is bringing out this fall." Buffalo Bill's admirer took us to his study, which is full of Wild West Show posters photographs of dance-hall girls — Big Nose Kate, Crazy Horse Lil, Big Minnie Bignon — and boxes and boxes of B.B. pictures and Wild West programs. "Here's Buffalo Bill signing a contract with Pawnee Bill to become partners," he said. "Here's Bill and Prince Ludwig of Bavaria in Munich in 1890. Here's the original of the only photograph showing Wild Bill Hickok, Texas Jack, and Cody together." "How about the tie business?" we asked. "Oh, I went to work for a tie manufacturer in Brooklyn when I was 14," he said, "and eventually became head cutter. The firm folded in 1948 and I went over to Brooks. We make ties to order for Alfred Vanderbilt and Clark Gable and so on, but I don't really like ties. What I like is Buffalo Bill. I believe that in the field of Buffalo Bill there's no individual that can top me. In some things I'm better than the Smithsonian or the Library of Congress." Mr. Mercaldo, who has a son of 15, three married daughters and eight grandchildren, seven of them little girls, introduced us to his wife, who handed us a drink. "I don't really like Buffalo Bill," she said. LW3420: 9600 dpi jpeg from original photograph purchased 2018 by Leon Worden.